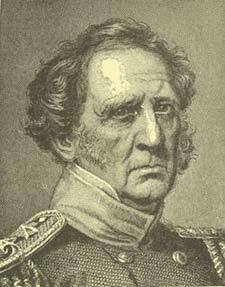 Winfield Scott was born at Petersburg, Virginia, on June 13, 1786. His father was a gallant Revolutionary soldier, his mother one of the well-known Virginia family of Masons. He attended the schools in his neighborhood, and graduated at the then famous college of William and Mary; and upon graduation began his career as a lawyer. All his tastes were military, however, and in 1807 he joined a volunteer organization to watch the coasts, which were menaced by the British frigates; there being then great excitement over the Leopard and Chesapeake affair. When this flurry subsided he went down to practice in South Carolina. Soon after his arrival there was another alarm of war, and back went Scott post-haste for Washington, again abandoning his law, with the hope of getting a commission in the army. Yet again, in 1808, the chances of war once more retiring to the background, he tried his fortune at the bar, this time in Virginia. Alarms of war were frequent during the next four years, however, and Scott rigidly confined his practice as a lawyer to the intervals when it was not deemed possible that there could be danger from abroad. In 1808 he was made a captain of light artillery, and was sent with his company to New Orleans. Scott was always frank in announcing his utter contempt for Jefferson's foreign policy as President, and his abhorrence of the men whom Jefferson got into the army at this period. West Point had only just started. Its few graduates did well in the war of 1812, but most of the other officers of the army were men appointed by political influence at the time, or else old officers who in their youth had had some experience in the Revolutionary War, but who were disabled by age, drunkenness, and long lack of acquaintance with military matters. Among the officers themselves there were savage factions, and Scott got into one or two scrapes in consequence of his advocacy of one of the parties. In May, 1812, the long-delayed hostilities were evidently close at hand, and Scott left New Orleans for Washington. In September, Scott, now made a lieutenant-colonel, reached Niagara, only to share in the humiliating though petty defeats with which the land war opened on our northern frontier. His first serious affair was at the abortive effort to storm the Heights of Queenstown. When Van Rensselaer, who had led the attack, was wounded so as to be unable to take further part, Scott himself assumed the command. At this time about a fourth of the American militia had crossed and were attacked by slightly superior numbers of British regulars and Indians. Their remaining companions, utterly undisciplined and with no leaders, were struck by panic cowardice and refused to cross to the assistance of their fellows. Scott behaved with distinguished personal bravery, rallying his raw troops and leading them in a charge with the bayonet, always a favorite weapon with him. Nevertheless his forces soon fell into disorder and were driven over the cliffs to the edge of the water, where, from lack of boats, most of the men were made prisoners, Scott among the number. Much difficulty was experienced by the British officers in preventing the Indians from massacring the prisoners. Scott was a man of gigantic proportions. This fact, and the reckless courage with which he had fought, had attracted the attention of the Indians. Some of them came into the room where he was confined and attempted to murder him, and only his great strength and quickness enabled him to beat them off until he was rescued by a British officer. Soon after his capture he was exchanged, and promoted to the rank of colonel. He joined the American armies as chief of staff to the major-general commanding, and being about the only man in the army who had any knowledge of tactical manuals and military treatises generally, he was kept busy from morning till night in organizing the staff service, drilling the officers, and the like. These duties, however, did not interfere with his leading and commanding his troops in battle. He led the advance guard in the successful assault on Fort George in May, 1813, took part in a number of skirmishes, and served with gallantry in Wilkinson's unsuccessful campaign. Early in the spring of 1814 a camp of instruction for officers and men was formed, with Scott in command, near Buffalo. Up to this time the imbecility of the administration (and of the people whom the administration represented) in not preparing for the war, had been well matched by the supineness with which they carried it on. During the eighteen months that had elapsed since the beginning of the contest, only the navy, built by the Federalists when in power fifteen years before, had saved the country from complete disgrace, the armies generally being utterly inadequate in number, and moreover models of all that troops ought not to be. Even in 1814 this remained true of the forces intrusted with the defence of the Capital itself; but on the northern frontier Scott, and his immediate superior, Brown, by laborious work succeeded in turning the inefficient mob of the first two campaigns into as admirable a weapon of offence and defence as ever was handled by a general officer. In July the little army of skeleton regiments, thus carefully drilled, was ready for the invasion of Canada. On July 5th the fight at Chippewa took place. The battle was practically between Scott's wing of Brown's army and Riall's British troops, the numbers being almost exactly equal. There was very little manoeuvring. After a tolerably heavy artillery fire and some skirmishing between the light troops and Indians on each side, in the woods, the British regulars and Scott's American regulars advanced against each other in line across the plain, occasionally halting to fire. It was noticed that the fire of the Americans was the more deadly; their line was thinner and more extended than that of the British. When within sixty or seventy paces of one another the two sides charged; there was a clash of bayonets; then the thinner American line, outflanking the more solid British column, closed in at the extremities, and the British broke and fled immediately. This was not only a needed victory for the Americans, but it was the first occasion for a generation that British regulars had been faced in the open, on equal terms, with the bayonet and defeated. At this very time the British had just brought to a close the terrible war with the French in the Peninsula. Their troops had been pitted successfully against the best marshals and the best troops of what was undoubtedly the foremost military power of Continental Europe; and now the American regulars, trained by Scott and under his leadership, performed a feat which no French general and no French troops had ever been able to place to the credit of their nation. Three weeks later the British and American forces again came together at the bloody battle of Lundy's Lane. The most desperate fighting on this occasion took place during the night, the Americans and British charging in turn with the bayonet, and the artillery of both sides being captured and recaptured again and again. The Americans were somewhat inferior in numbers to the British, and the slaughter was very great, considering the number of men engaged, amounting to nearly a third of the total of both forces. In the end the fight ceased from exhaustion, the armies drawing off from one another and leaving the field of battle untenanted; but the result was virtually a victory for the British, for the next day they advanced, and the Americans retired to Fort Erie. Scott, who had exposed himself with the reckless personal courage he always showed when under fire, was dismounted and badly injured by the rebound of a cannon ball in the early part of the battle, and about midnight, just before the close of the actual fighting, received a musket ball in the body which disabled him. Scott did not recover from his wound in time to take part in the remaining scenes of the war. After its close he went abroad, visiting London and Paris, and being very well received, returning in 1816, and again taking up his duties in the army. He indulged himself in the luxury of a sharp quarrel with Andrew Jackson, a luxury which any man could easily obtain by the way, but which was too much for any man not possessing Scott's abundant capacity to take care of himself in any conflict. He interested himself greatly in improving the tactics of the army, and went out to take command in the Black Hawk war, where he had no opportunity to distinguish himself. At the time of the nullification outbreak in South Carolina he was appointed to see to the interests of the United States in Charleston, where he acquitted himself with equal tact and resolution. He commanded in the Seminole war, but again had no opportunity to distinguish himself; and in the winter of 1837-38 was stationed on the northern frontier, where he succeeded in preventing invasions of Canada by American sympathizers with the then existing Canadian rebellion. Soon after this he superintended the removal of the Cherokees from Georgia, doing everything in his power for the Indians, who, in defiance of the pledged faith of the United States, were being driven out of that State. For the next few years Scott was comparatively inactive. He had a great taste for politics, and could not forbear meddling with them, although he was at the time general-in-chief of the army. He was a very sincere Union man, and was an outspoken Whig, though with a strong latent leaning to the Know-nothing party; for he distrusted both foreigners and Catholics. He would not own slaves, and disbelieved in slavery, but he also utterly disapproved of the actions of the political abolitionists of the day. He was not only a very ambitious but a very vain man, and at times his desire for civic honors led him to try for success on fields where he did not show to such advantage as on the field of battle. When the Mexican war broke out, the President, Polk, whom Scott detested, was reluctant to see Scott given a chance to make a record, in view of his being a pronounced Whig, and of the probability that a successful general, if nominated on the Whig ticket, would sweep the country. However, toward the end of 1846, it became impossible longer to pass by Scott's demands for active service, and, moreover, the administration felt the less reluctance inasmuch as Taylor, another Whig, had achieved much credit by his victories along the Rio Grande. Accordingly Scott was despatched with a fine army to attack Mexico from the seaboard of the Gulf and to penetrate to the capital of the country. Early in March of 1847 he landed near the city of Vera Cruz, with 12,000 men. Trenches were opened, a bombardment begun, and the castle of San Juan de Ulloa surrendered on the 27th, 5,000 prisoners and four hundred pieces of artillery falling to the victors. Scott lost in all but sixty-four men killed and wounded. As soon after this victory as he could gather horses and mules the army started for the interior, and on April 18th encountered the Mexican army, about the same in numbers as Scott's, under Santa Anna, strongly posted at Cerro Gordo. Scott made his plans with great skill, and the battle is remarkable because of the closeness with which the methods and results of the actual attacks followed the outline which Scott gave of what he wished accomplished, in his general orders of the day previous. The Americans attacked with resolution. In places the Mexicans defended themselves well, but in other places, where their troops were raw, they gave way very quickly, and, as a result, the whole force was speedily routed and driven in headlong flight, with great loss of artillery and prisoners. Scott pushed closely after them, but almost immediately was halted by the necessity of discharging four thousand volunteers whose terms of service had expired. After waiting in vain for reinforcements, the Americans again marched forward, and halted some time at Puebla, where the long-looked-for additional troops finally arrived in August. The army had suffered a good deal from sickness, and Scott was anxious to bring it into contact with the enemy as soon as possible. Accordingly he pushed straight for Mexico. The Mexican armies, numerically about equal in strength to his own, occupied very strong positions, from which they were driven only by desperate fighting at Contreras, San Antonio, and Buena Vista, the Americans losing 1,000 men killed and wounded, but capturing 3,000 of their adversaries and thirty-seven pieces of artillery. An armistice followed, but the negotiations came to nothing, and in September hostilities were resumed. The strong outworks of Molino Del Rey and Chapultepec were stormed with great loss to the Americans; for they were places of formidable strength, the Mexicans defended themselves well, and the assailants were few in numbers. The bravery of the victors, under these circumstances, showed that Scott had not forgotten the art which enabled him to turn the raw troops of 1812 into men who, alone among the troops of civilized nations, could meet the British infantry in the open on equal terms. The City of Mexico fell immediately after the storming of Chapultepec, and Scott marched in. There was no further fighting of consequence, although bands of guerillas and brigands of all kinds had to be dispersed. Scott treated them with proper severity. The campaign ended unhappily for Scott in one way, for he became embroiled with the administration and some of its partisans among the high officers of the army, the intrigues which caused this embroilment being instigated chiefly by Democratic jealousy of the Whig general. However, he was thanked by Congress. This was the end of Scott's active service. He again plunged into political life, and in 1852 ran for the presidency on the Whig ticket, but was hopelessly defeated. He continued general-in-chief of the army until 1861, when he retired from the command. He was too old to take the field and do his part toward the suppression of the rebellion, but he remained stanchly loyal to the flag upon which his victories had conferred such glory, and to which he himself had owed so much. Even when his State seceded it did not affect him or cause him to waver in his allegiance to the country for which he had so often drawn his sword. He died May 29, 1866. Scott had many little vanities, and peculiarities of temper and disposition, at which it is easy to laugh; but these are all of small moment in estimating the man's character and the worth of his services. He was a fearless, honest, loyal, and simple-hearted soldier, who served the nation with entire fidelity and devotion. He was very successful in battle, and, not only his crowning campaign against Mexico, but the way in which he trained and led his troops in the Canadian campaign against the British, show him to have possessed military abilities of a high order. His name will always stand well up on the list of American worthies.